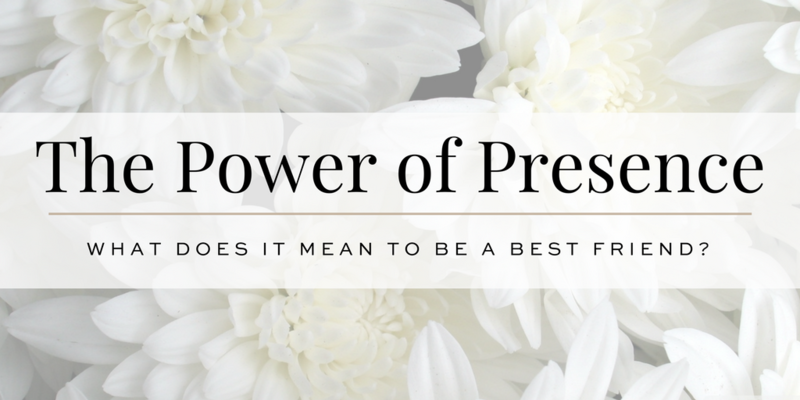 The Power of Presence – Ronica Arnold Branson, Ph.D.
We don’t often talk about it much, but what does it mean to be a best friend? Throughout the years we’ve shown our support for our girlfriends, introduced them as best friends, and even said we would be a friend for life. 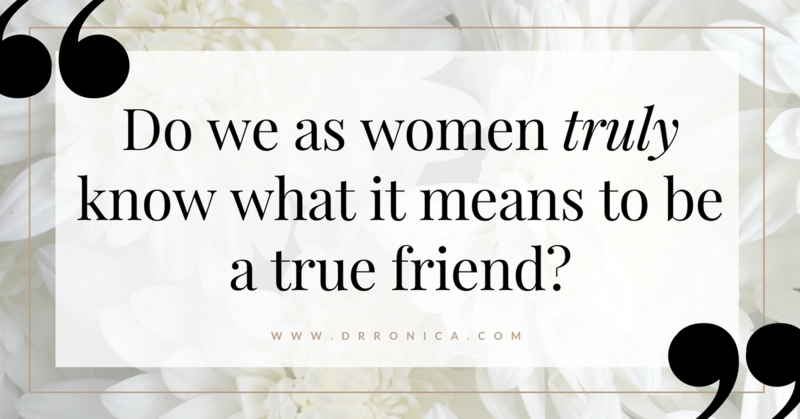 But do we as women truly know what it means to be a true friend? When you hear the word Best-ties, BFF’s, girlfriends, and Best Friends what usually comes to your mind? The two faces that usually pop to my mind are Oprah and Gayle. No matter where they go, no matter what they do, even with their separate interests, careers, lives and families, it seems that through it all, they have remained best friends for years. Friends, Best friends, Sister friends are those friends that are there for you when you need a shoulder to cry on. They are the ones to help you regain your sanity. They know our secrets, they know our pains, they know how to make us laugh when we need it, and they are there to give us that hug when we need to cry. Everyone wants to stick around when you’re up and at ’em and having a good time, but you know who your TRUE friends are when you are at your lowest points. When you’re in that hospital room alone wishing someone would just bring you a snickers bar at 11:58 when you’re NPO at 12, or help you move and unplug all the crap that you’re attached to so that you can just go to the bathroom. They are there when your life truly IS the Lifetime Movie of the week, and it’s nothing fun about it. Real friends are the ones that understand you, are not judgmental, and just appear without you even making the call. These moments are priceless. 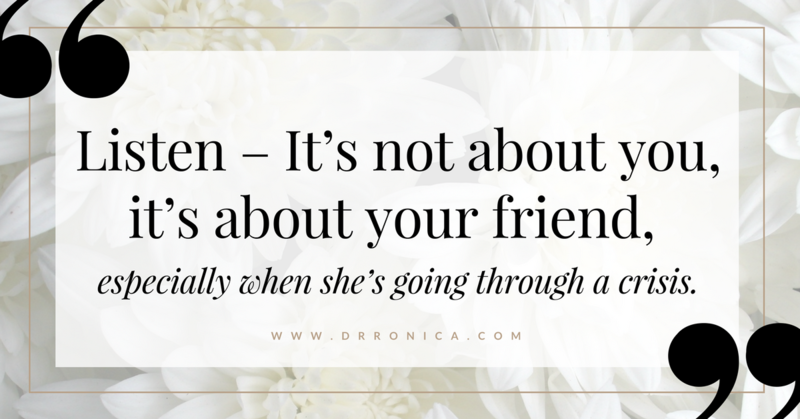 Listen – It’s not about you, it’s about your friend, especially when she’s going through a crisis. Many times your friends just want you to be there to hold their hands or tell them a crazy story. Sometimes they want and need you to listen because no one else will. Sometimes you just need to listen to what they have to say about their fears, about their thoughts for their future. Can you stay present long enough to hear what they are saying? Take time to listen to your inner voice. How is your higher being telling you to handle this situation? What is it that you feel in your heart, you need to do for your friend? Whatever it is, DO IT! If it’s going to visit them in the hospital when they’ve been caring for a loved one, if it’s keeping the kids for the weekend, if it’s taking them dinner for the night. Listen to your inner voice and do something they would least expect. Tell them you love them and how much their friendship means to you. Sometimes we can feel that our life is not significant. Going through the daily routines seems more like a chore and a responsibility. Too often we take for granted telling our friends we love them. We think they automatically know it, but sometimes it just feels good to hear it. You are special to me and my life has been touched as a result of having you in it. Give of yourself without expecting anything in return. No matter what has happened in the past, no matter how much they’ve done for you or how much you’ve already done for them. 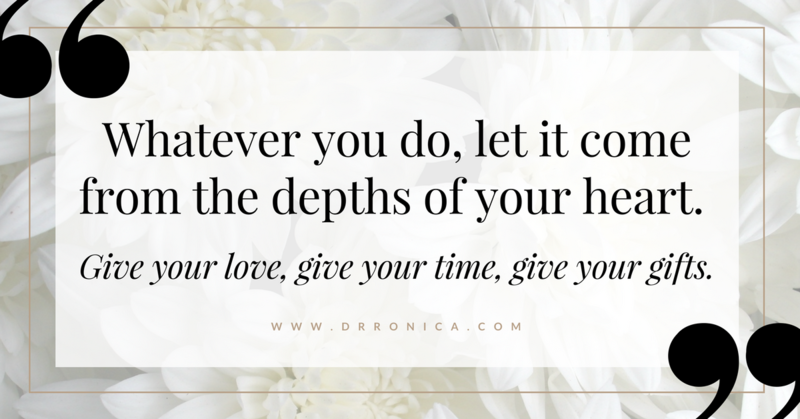 Whatever you do, let it come from the depths of your heart. Give your love, give your time, give your gifts. A true friend is there when you need them and doesn’t expect anything in return. Everyone will not understand your relationship. That’s what makes our friendships special. It’s not understandable. As long as you know the true meaning of your friendship, that’s really all that matters. People come into you life for a Reason, a Season, or a Lifetime. They have come to assist you through a difficulty; to provide you with guidance and support; to aid you physically, emotionally or spiritually. Then, without any wrongdoing on your part or at an inconvenient time, this person will say or do something to bring the relationship to an end. What we must realize is that our need has been met our desire fulfilled; their work is done. The prayer that you sent up has been answered and now it is time to move on. Some people come into your life for a SEASON, because your turn has come to share, grow, or learn. They may teach you something you have never done. They usually give you an unbelievable amount of joy.